Learn everything you ever wanted to know about getting started with calligraphy! Based on our popular Modern Calligraphy series, the Calligraphy Bootcamp offers an all-in-one approach to learning about the tools of the trade for calligraphy. In 4 hours, our calligraphy JamMaster will introduce you to the basic techniques of pointed pen calligraphy and guide you through exercises to enhance your skills. Calligraphy is a millennia-old art form, with its roots in both Eastern and Western cultures traditionally used for illuminated manuscripts and formal writing. 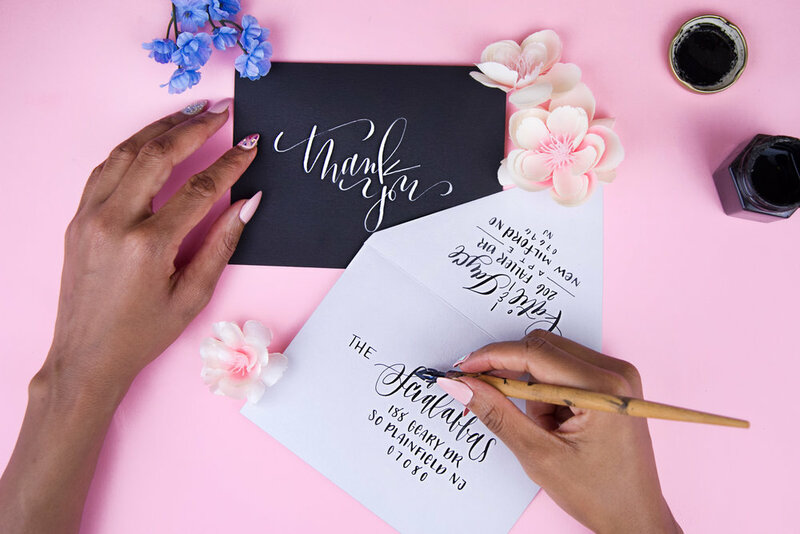 Modern calligraphy spurs from this by using both new and traditional tools: it’s a more free form style of writing that maintains the elegance of traditional calligraphy while allowing for more self-expression. This workshop series will focus solely on pointed pen (also called dip pen) calligraphy, in order for you to develop a strong formal introduction and understanding of the tools used in calligraphy. This workshop serves as a foundational course upon which other skills can be built. This class is beginner friendly; no experience necessary! We will have all of the supplies and materials ready for you. During in-class exercises, you will learn the basic skills for modern calligraphy, including proper pen handling and calligraphy posture, a full script alphabet in upper and lower cases, and practice your new skills with a fun project. You will receive a dip pen with two different styles of nibs and a small bottle of ink for you to continue practicing at home. Lefties are welcome to attend class too! This class is especially good for people who love hand lettering, want to use calligraphy in their upcoming nuptials, or already know how to write letters and would like to learn the basics of traditional calligraphy. Also, we are BYOB friendly, so bring a drink of your choice. Note: This is class is an updated version from our previous CraftJam Academy: Modern Calligraphy Workshop hosted in three sessions. Please note: this class is meant to be taken instead of the 2-session class, not in addition.